Come into my living room! Just a quick post tonight to share a few pictures of my cozy living room. It is my favorite room in the house and is the best living room arrangement I’ve ever had. I am absolutely tickled pink with how it turned out! I wish I had a better camera so I could capture the ambience of the room with its warm lighting, but when I tried photographing things with no flash, the pictures were just too dark. So you’ll have to settle for “flashy” pictures and just imagine the warmth and comfort of this cozy room! First, here is the view from the inside wall when you stand with your back to the dining room and kitchen. The corner cupboard that used to be in the dining room of my old house now has a place in the living room due to the corner fireplace in the trailer dining room. I really love it in here, though, because it adds a lot of cottage character!The rocking chair was a gift from dear friends when we had a new baby, and I never seemed to have a place for it in the old house (in spite of its being a larger home!). It works so nicely in this room. 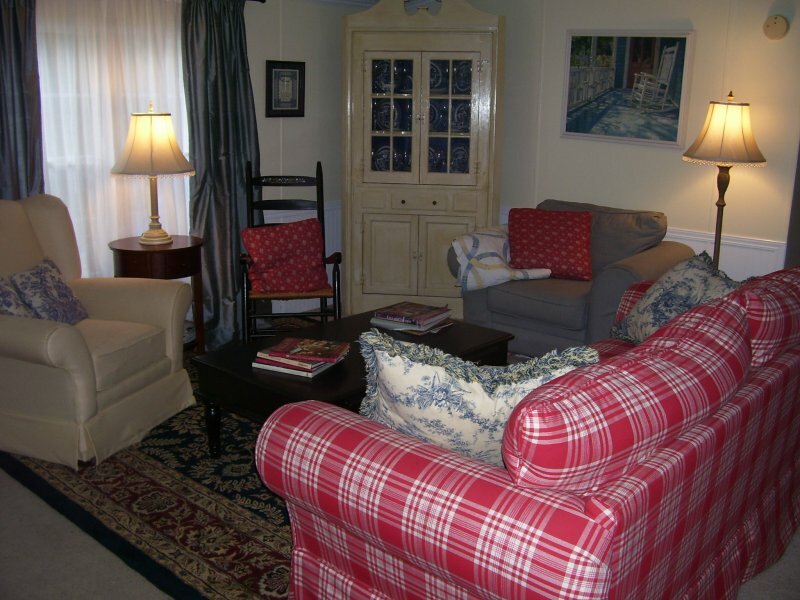 As you can see, we have French Country color scheme going here with the reds, blues, yellows, plus black accents. I hung the curtains right at the edge of the ceiling (about a foot above the windows) to give the illusion of greater height. The curtains are a mixture of ones that were in my old dining room (blue) and ones from my old bedroom (the sheers over the windows). I love the soft, flowing look. The overall effect of the room is so homey and cozy that I find myself using this room far more than I ever did a formal living room in the past. The children and I love to cuddle up on the couch and read together. 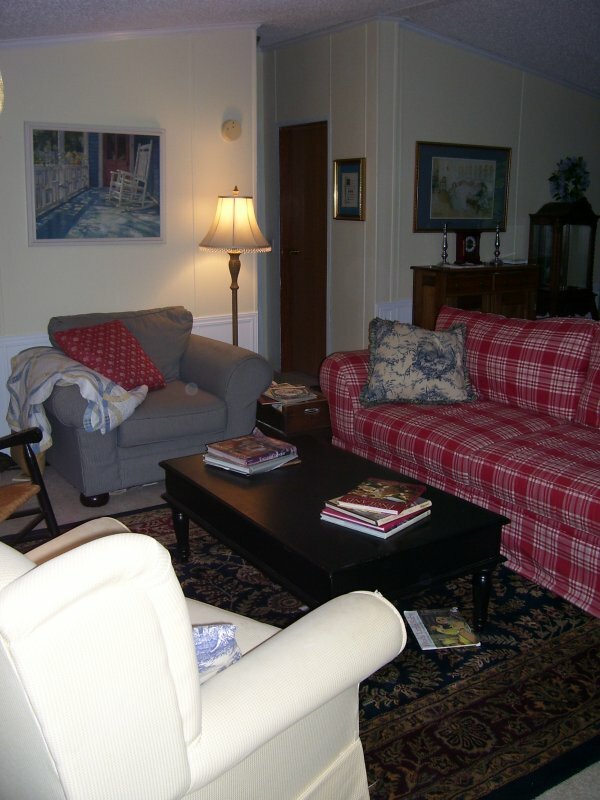 I pulled the room together with a wonderful oriental rug we received from my father-in-law. This creates a defined area for the rest of the furniture. At first I was afraid it wouldn’t fit without blocking some of the air vents on the floor, but my husband figured out the best placement, and we just love the look. At right is the view when you first come in the front door. You can just see the hallway and the end of the dining room behind the couch. We have lots of artwork from our old home, and we’ve managed to find space for almost all of it. We figured we’d just imitate the British and cover the walls with paintings, prints, and photos! The red couch is probably my favorite piece of furniture in the room. I have plans to slipcover it so I can change its look from season to season. I have about 12 yards of a blue and creamy yellow Waverly stripe that I found on eBay for $41 — that’s 12 yards for less than the retail price of two! Gotta love it. Don’t know when I’ll get around to that project, but I’ll be sure to blog about it. I’d love to have the cover made by next spring, since it will make a nice change in the room and will make things seem cooler when the hot weather rolls around. Finally, here is the view of the entry wall with the plates over the table that I’ve shown in a previous post. I still have plans to make the table skirt, and now that I’ve found the fabric, I hope to get that done in the next week or so. 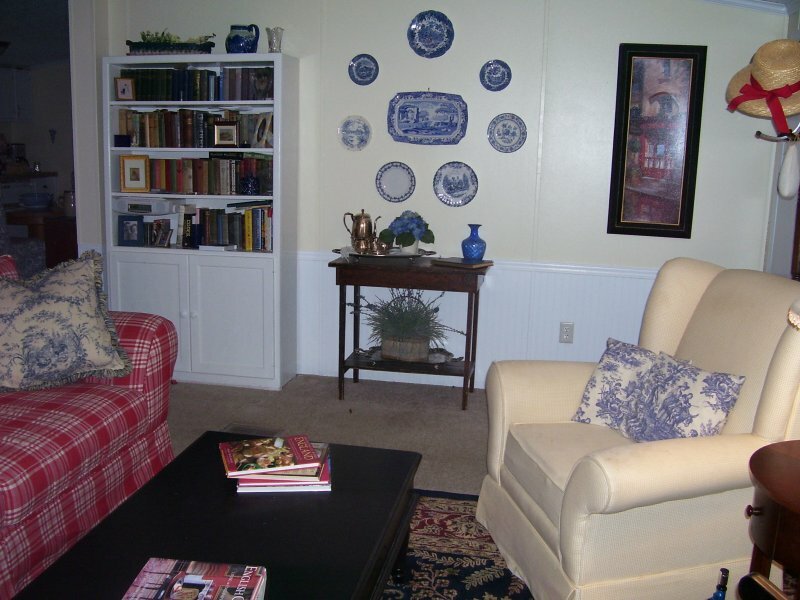 It will really soften up that wall, which has a lot of hard lines with the long painting, the table, and the bookcase. You can see a hat in the upper right-hand corner of the photo. That’s hanging on a hall tree stand that my husband loves to use for his own hats. Now they are right within reach when he goes out the front door! I put one of my favorite hats there as well. This is just a really wonderful room. I’m filing away mental notes for our future dream house (the one we hope to build ourselves one of these days!). I’ve learned so many things from the various houses we’ve lived in, and I’ve got a big folder of notes about what has worked and what has not. Some of the things that work so nicely about this house are probably the very things that would make a double-wide unappealing to some folks. Yes, this is a fairly small house, but the smaller size makes housecleaning a real breeze! It takes half the time to clean this house than it did to clean the old one. I also love the fact that the kitchen, dining room, and living room make up a friendly triangle where I can be with my children and easily carry on conversations with family and friends. The walls are thin, yes, but that makes it easy to hear my children and speak to them without having to raise my voice as much as I did in the old house with all its far-flung corners!